Prada will launch Luna Rossa Extreme in October. The new fragrance for men is a variation on 2012's Luna Rossa. Luna Rossa Extreme was developed by perfumer Daniela Andrier. Notes for the aromatic amber fragrance include bergamot, black pepper, labdanum, juniper berries, lavender and vanilla. 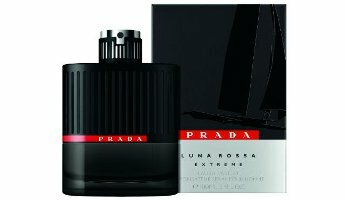 Prada Luna Rossa Extreme will be available in 100 ml Eau de Parfum. It might be, & agree that Andrier is wonderful, also agree that Amber Pour Homme is WAY better than original Luna Rossa. So we’ll see! I could barely smell Luna Rossa, it was soooo wimpy and fleeting! Will check this out in the South Beach sephora hehehehe Canjot wait for October to arrive! It wasn’t an assertive scent, it’s true. I never figured Prada would become so Flank-tastic, Prada APH was so fantastic. Finally the mainstream men’s perfume world is venturing (albeit still too slowly IMO) into the “EdP” concentration. WOW…they wasted no time. Luna Rossa is blah, but I hope this is better.